Access from off-campus is EASY!! All library electronic resources are accessible remotely by IFT students, faculty and staff via the Library EZproxy Server. 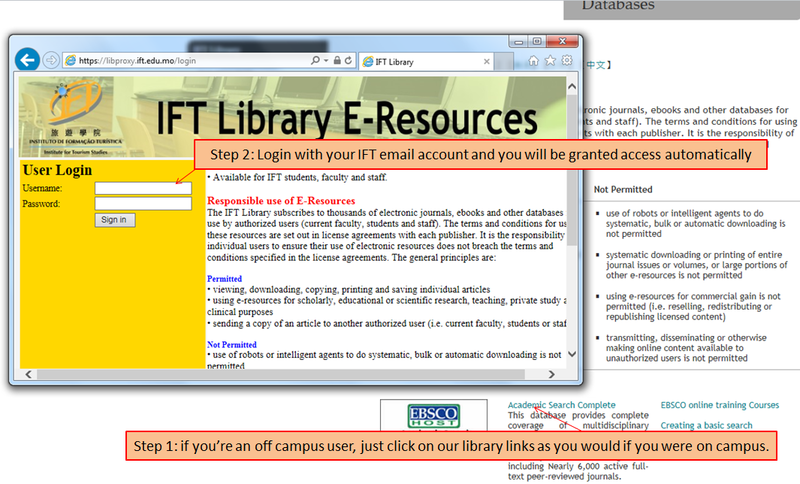 Library users with valid IFT email ID and password may access from off campus a variety of Library subscribed resources including e-journals, databases, e-books and podcasts etc. listed in the Library Catalogue and Library Homepage. In order to access the Library remotely, user’s computer/smartphone/tablet must have an Internet connection and leave the browser default to accept "cookies". If you are having problems accessing resources, please contact us at library@ift.edu.mo.